Prepare and bake corn bread according to package directions. Cool on a wire rack. Crumble corn bread into a 2-qt. glass serving bowl. Layer with onions, green pepper, corn and beans. 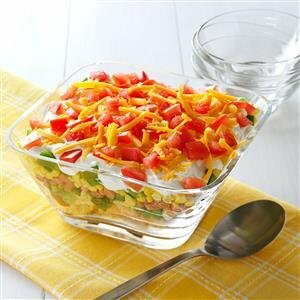 In a small bowl, combine mayonnaise and sour cream; spread over the vegetables. Sprinkle with tomatoes and cheese. Refrigerate until serving. Makes 6-8 servings.